A snare is a trap in which the force that keeps the victim trapped comes from the victim. Not all traps are snares. The classic bear trap isn't a snare, because it holds the victim by the force of a spring. An example of a snare is the (possibly apocryphal) "monkey trap." much larger opportunitiesIn one version, you place a heavy narrow-mouthed container on the ground, and insert a sweet-smelling nut as bait. The monkey reaches in to grab the nut, but can't withdraw its fist, which is now too big to pull out. Unwilling to release the nut, the monkey is trapped. This is a snare because it is the monkey's own action that traps it. Snares can be attractive, repulsive, or both. Attraction snares tempt the victim, who is ensnared by continued effort to attain the bait. Repulsion snares are just the opposite — the victim is ensnared by fear, and continued efforts to avoid the threat. Combination snares contain both bait and threat, which we usually call "incentives" and "disincentives." 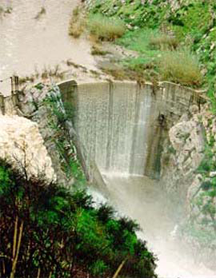 The Rindge Dam, in Malibu Canyon, California, is an example of a snare that's both attractive and repulsive. Completed in 1926, the dam was intended to control floods and conserve water for the Rindge Ranch, operated at the time by May Knight Rindge. These purposes were the attraction or incentive component of this snare. By 1950, however, the reservoir had largely filled with silt. It no longer serves its intended purpose, and the Rindge Ranch no longer exists. Reopening the stream would give habitat access to steelhead trout and other native species, and would increase silt flow to rebuild Malibu Beach. But it would require the relocation of upwards of one million cubic yards (cubic meters) of silt, removal of all or part of the dam, and according to the Malibu Creek Watershed Council, an estimated $5 to $40 million dollars. These efforts and costs are the repulsive parts, or disincentives, of the snare. Meanwhile, the dam has remained in place, essentially useless, for 50 years. Photo courtesy Malibu Complete. One common repulsion snare is the sense that we can't cancel an effort because we have too much invested already. Eventually, we might complete the effort, but the cost can be so high that the net value returned is negative. Repulsion snares can also arise from feelings. For instance, even thinking about failures can be painful, but unless we do, we can't learn from them. Here the snare consists of our own feelings about failure. It can prevent many organizations from holding retrospectives, which dooms them to repeat preventable failures. An attraction snare can arise when an organization fails to exploit a new technology because it's excessively committed to an existing technology. For instance, many have argued that the US railroads failed to move into air transportation because they were ensnared by the rail passenger businesses they were already operating. Attraction snares also work on people. "Golden handcuffs," a common element of retention strategies, uses the bait of inordinate financial rewards to persuade people to stay in positions perhaps longer than would otherwise be in their best interest. The bait often consists of stock options, but while those options vest, other factors set in: family, community, increasing age, aging of their expertise, and so on. Snared at first by the promise of disproportionate financial reward, employees can become ensnared in their jobs by these external factors. Would you like to see your comments posted here? rbrenoNVnDsZHQXThOyqZner@ChacZdoJTfMSPJmaQmnFoCanyon.comSend me your comments by email, or by Web form. See also Workplace Politics and Critical Thinking at Work for more related articles. I offer email and telephone coaching at both corporate and individual rates. Contact Rick for details at rbrenyDCgAYVGEeSpuKYrner@ChacSkOfBEnmDBFrhMSJoCanyon.com or (650) 787-6475, or toll-free in the continental US at (866) 378-5470.